Beneath The Underdog [mingus1021] : Jazz Record Center, Rare and out-of-print books, records and more. 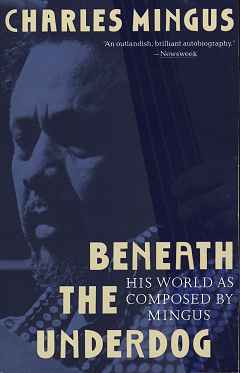 A classic in jazz literature, Charles Mingus' memoir is wild, funny, demonic, anguished, shocking, and profoundly moving. He tells of his God-haunted childhood in Watts in the 1920s and 1930s; his outcast adolescent years; his apprenticeship, not only with jazz musicians but also with pimps, hookers, junkies, and hoodlums; and his golden years in New York City with such legendary figures as Duke Ellington, Lionel Hampton, Miles Davis, Charlie Parker, and Dizzy Gillespie.